This looks wonderful. You have to see this! GKIDS has debuted a beautiful trailer for the Brazilian animated film The Boy and The World, a feature film that is "entirely wordless, the narrative describes a clash between poor and rich, countryside and city, indigenous and imperial, handcrafted and mechanized – and throughout the tumult, the heart and soul of the people beats on as a song." It's from Brazilian filmmaker Alê Abreu, and features a lot of amazing imagery from Brazil telling the story about this boy going to the city. It's also told with music, using the pan-flute, samba, and Brazilian hip-hop. I'm not sure what to make of it until I watch the entire thing, but this has convinced me it's worth seeing and may end up with an Oscar nomination anyway. It will arrive in US release this December, before playing wider throughout January. Cuca lives a life of quiet wonder, exploring all that the countryside has to offer. But his cozy life is shattered when his father leaves for the city, prompting him to embark on a quest to reunite his family. The young boy’s journey unfolds like a tapestry, the animation taking on greater complexity and variety as his small world expands. Simple line drawings of the village give way to broad brushstrokes forming giant bushels of cotton lining country roads and sweeps of pastel churned into roaring waves. Approaching the city, industrial landscapes are inhabited by animal-machines, whirling carnival colors and exploding fireworks fill the sky above decoupage favelas, while flashing neon advertisements and garish shop windows illuminate the night. 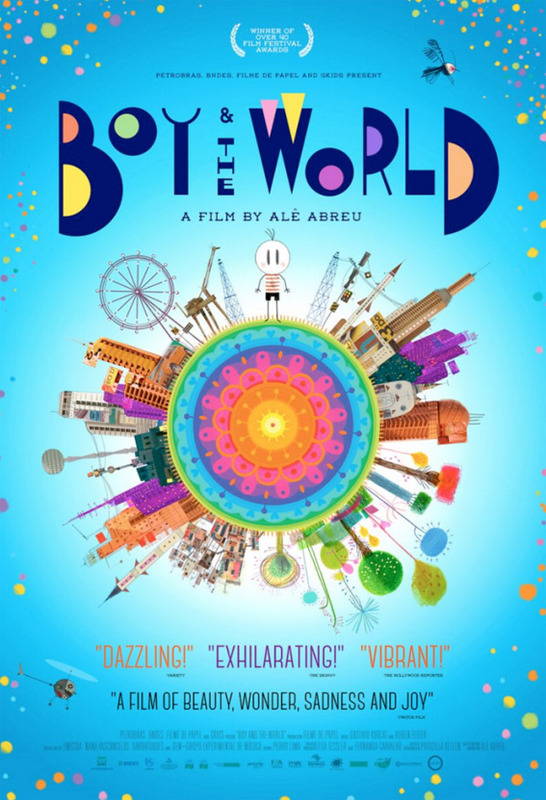 The Boy and the World, known as O Menino e o Mundo, is both written & directed by Brazilian filmmaker Alê Abreu. GKIDS will open in limited theaters this December. Wow. Looks cool. The art-style is neat. very refreshing. Can't wait to see this with my son. another GKIDS Film a can't wait..! !